Kim Jong Il's Macbook, Luxury Yacht and Train In Which He Died Also on Display. WASHINGTON DC – The first group of western tourists to lay eyes on the embalmed body of former North Korean leader Kim Jong Il have described their experience variously as, “shocking” and “surreal” and have revealed that according to a new mausoleum exposition on his life, Kim Jong Il was a proud MacBook user, NK NEWS can exclusively reveal. This week marks the first time that western tourists have been granted a first hand glimpse of the man that led a nation through the worst famine and politically unstable period of the country’s history. The embalmed body of Kim Jong Il, who died on December 17th, 2011 was placed on display alongside his father Kim Il Sung at the Kumsusan Memorial Palace in Pyongyang late last year. NK NEWS spoke exclusively to the group of tourists given first access to see it, to find out about the visit and their impressions of seeing Kim Jong Il’s body in the flesh. 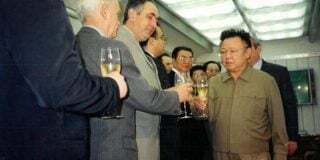 The group, travelling with Young Pioneer Tours, reports being ushered into a soberly lit hall in groups of four, where they were required to approach Kim Jong Il’s corpse and bow at his feet, before walking around the body and being ushered out at the other side. Protecting Kim Jong Il’s body were four strong looking soldiers wearing officer’s uniforms, stationed in each corner of the room. 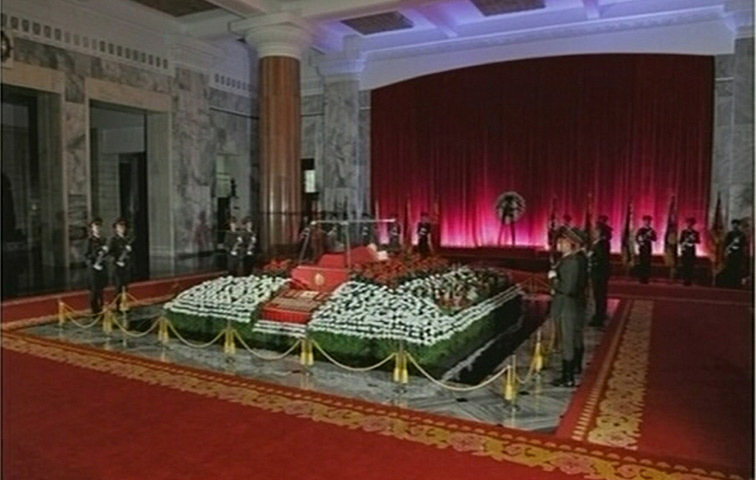 With the unveiling of Kim Jong Il’s body at the mausoleum complex come some significant changes to the visiting process. Now, following the viewing of “Eternal Presdient” Kim Il Sung’s body, tourists move on to a series of new rooms that contain background on Kim Jong Il’s life, a collection of his major possessions, and finally, the embalmed corpse itself. The new Kim Jong Il exposition rooms include a wall that features a large map of the world detailing all of the destinations that the late leader ever visited. While many claim that Kim Jong Il never flew, Fenner said that there were lights on the map that illustrated flights he took to both Indonesia and Russia. However, compared to the travel that Kim Il Sung did, Fenner said he had been “surprised how little Kim Jong Il had travelled”. 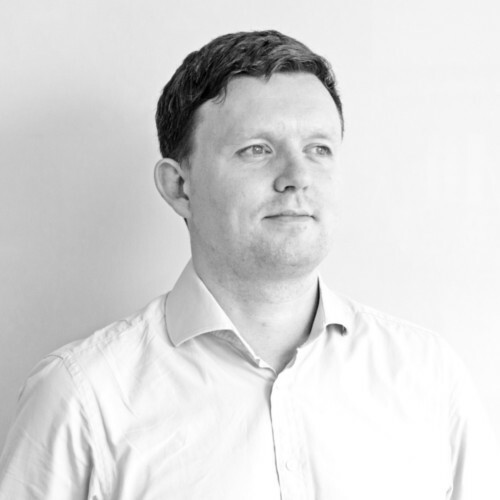 Providing details about the yacht on display, Fenner said that the North Koreans “had put a lot of thought into how it is presented, with a fake board of water at the bottom so that the ship actually looks like it is sailing in water”. At 20m long, Fenner said that it looked “upper class and smart”, but the display suggested the boat wasn’t only for pleasure, as it has a large meeting hall in it. Previously, tourists were given audio headsets that included an English language program that provided commentary while moving around the mysterious complex. That’s now gone, with tourists accompanied by a North Korean guide who provides information on what is being viewed as the group walks around for what is an approximately 90 minute experience. Entering the palace is just as it was before, explained Fenner. Visitors go through a complex security procedure that sees them going through metal detectors, entering a wind-tunnel to blow dust off clothes, and walking over a shoe cleaning machine to keep the palace floor clean. 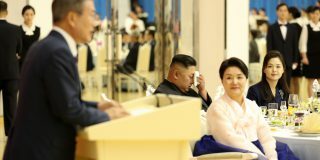 Another new development was that outside the palace, “under the orders of Kim Jong Un”, the North Koreans have introduced seats and tables for locals to use. While the winter weather meant that nothing was in use during the time of the Young Pioneer Tours visit, Fenner said that by summer he predicted the facility would become a popular congregation point. The Kumsusan palace was built in 1976 as the Kumsusan Assembly Hall, and served as Kim Il-sung’s official residence . 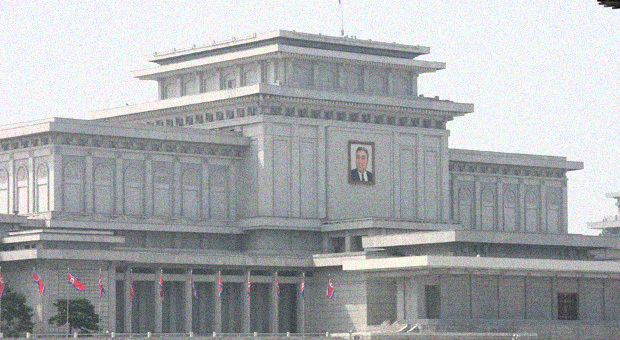 Following the elder Kim’s death in 1994, Kim Jong-il had the building renovated and transformed into his father’s mausoleum at a cost that was estimated to be at least $100m. Click here to find out tour about travel to NK with Young Pioneer Tours. NK NEWS speaks exclusively with the first foreign tourists to be granted permission to view Kim Jong Il's embalmed body, and describe new exposition depicting him as a yacht-sailing, Apple Mac loving man. Subscribe to read the remaining 980 words of this article.